The State of California has been consumed by a severe budgetary crisis. Brought about by a combination of the large number of foreclosures, the loss of jobs and a distinctively Californian budget approval process(specifically, the requirement that all fiscal measures be approved by two-thirds majorities in both houses of the State Legislature), each year since 2007-2008 has witnessed prolonged negotiations that have resulted in significant cuts to public education and hum an services and–in the case of the State’s public university systems (the University of California and the California State University) and community colleges– tuition and fee increases for students, salary reductions for faculty and staff and significant reductions in course offerings. Recent forecasts indicate that the State’s budget crises will continue into the future. Perhaps not surprisingly, opposition to the proposed budget cuts and the increases in student fees at the higher education systems has principally emerged from student groups in the higher education institutions. 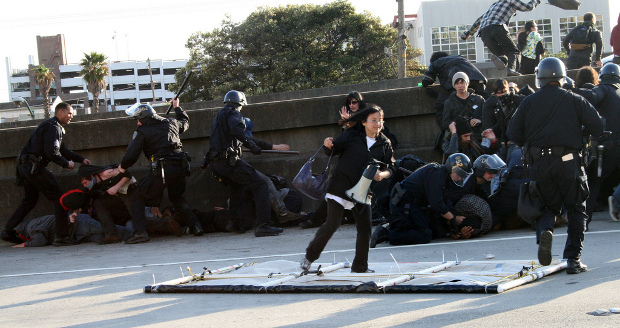 In October of 2009, a state-wide conference of oppositional forces took place at the University of California/Berkeley. The conference’s attendees agreed on a Call for a Day of Action on March 4th. Many thousands of individuals participated in actions across the state—most of which took the forms of rallies and marches. In a few cases, the actions took more radical directions. Afterwards, a Bay Area group, Advance the Struggle (AS), published an analysis of the politics leading up to the Day of Action that attempted to differentiate between three different political currents—centrists, adventurists and “genuine” class struggle leftists (among which AS counted itself). Their analysis was responded to by Socialist Organizer, a Fourth Internationalist Trotskyist group and one of the centrist groups included in the AS analysis; in turn, a member of Unity in Struggle (a group that is affiliated with Advance the Struggle, posted a follow up response. The discussion appears to have attracted a good deal of interest with more than sixty responses posted to the original article. What is especially noteworthy is that the discussion, for the most part, has been a very serious one—with little name-calling. We excerpt from the exchanges below (but we urge all readers to look at the full texts available on the cited web pages). We’ll join the discussion ourselves in the next issue of Insurgent Notes. …the twin pitfalls of tailism (following behind proposals for petitions and legalistic protests) on the one hand, and adventurism (isolated militant action) on the other. Both of these approaches sidestep the political consciousness of the masses. Conversely, what is important to learn from and respect about the adventurists is that their literature and propaganda attempts to put forward a more total revolutionary vision for insurrection and communism; coupled with this, their actions do more to directly challenge capitalist property relations and bourgeois hegemony. The problem arises in that this means very little without meeting people where they’re at and building organizational structures in workplaces, schools and communities, so that people may move from being spontaneous participants in flashes of direct action and proceed to become active intellectual participants who understand revolutionary theory and strategy. The failure to break down capital’s hierarchical division between mental and manual labor also, ironically, ends up often leaving people where they’re at just as much as the Centrists do. People participate or defend an occupation and have a radicalizing experience, but generally don’t find an outlet by which to reflect on this experience and use it as a basis for developing a revolutionary vision of the world. On October 24, more than 800 students, teachers, and workers came together at UC Berkeley (UCB) to decide on a statewide action plan to defend public education. Was it correct for the October 24 conference to have called for a “strike and day of action,” leaving open the choice of action to each school, or would it have been better had it, as AS and others argued, called instead for a strike of all the public sector? A call for a strike would help politically orient activists in the right direction. We will argue in this article that the political proposals and perspectives put forward by AS in “Crisis and Consciousness” are rooted in an incorrect assessment of the current objective situation, one of the most important factors of which is the current state of consciousness of the working class as a whole (not just the vanguard elements). In turn, this erroneous characterization of the concrete situation in California is rooted in what we believe is AS’ flawed approach to developing mass movements and working-class consciousness. For Marxists, the action proposals (our ) we raise in the mass movement at any given moment must be based on a serious analysis of the objective situation (i.e., the conditions that are outside our immediate influence). Of course, objective conditions and working-class consciousness are fluid (not static) and can be changed via human agency and under the pressure of events. But at a given moment these conditions are very real and play an important role in limiting (or facilitating) our actions. The art of revolutionary politics consists precisely in evaluating how far we can push forward the mass movement at any specific moment, based on our analysis of the current objective conditions. We should push for a strike — i.e., the most effective weapon of our class (short of insurrection!) — on campuses and in the unions where possible. The “Strike and Day of Action” formulation does not preclude a fight for a full strike at any given school or workplace: real strikes will happen if we are able to win the majority of workers and students to support one, not based on the formal language of a conference resolution. While strikes are the ideal tactic, mass protests, walkouts, rallies and other forms of resistance are also very important (and not counterposed) vehicles to advance the mobilization, self-confidence, and (through this process) the consciousness of workers and students. It is precisely through their experience in these “lower” forms of actions that most workers and students can come to the realization of the need for a strike (provided the revolutionary vanguard participates in this process and moves it forward). Given the current objective situation — marked by the very uneven level of mobilization depending on education sector (K-12, UC, etc. ), region, relative class status (i.e., students, workers, teacher, etc. ); the subordination of the leaderships of the trade unions to the Democrats; and the repressive anti-strike laws that penalize solidarity strikes — it is not very likely at this moment that many — let alone most— campuses and workplaces will be able to strike on March 4. Thus, to limit the 10/24 call to only a strike will mean precluding the majority of schools and unions from endorsing the call and participating. If we want March 4 to be as massive and broad as possible, if we aim to build a united front coalition statewide and locally, and if we aimed to push the unions — the only existing mass organization of our class — to mobilize against the cuts, then the statewide call has to be broad enough to encompass the different levels and layers of the movement. AS argues that our support for the compromise proposal “specifically disregards any attempt to articulate a strategy for victory.” But, in reality, we defended the “compromise proposal” in the framework of coherent strategy for victory, as outlined above. We think the actual experience of March 4 completely vindicated this perspective. It was precisely the broad appeal of the “Strike and Day of Action” formulation (plus the widely representative nature of the united-front 10/24 conference of more than 800 activists) that allowed the March 4 call to spread like wildfire. March 4 was a tremendous and empowering success, which made a significant nationwide impact. Literally thousands of schools participated. Hundreds of thousands (some say millions) took to the streets in more than 33 states. All trade unions in public education mobilized to some extent. Unity was forged between the different sectors of public education; between students, workers, and teachers; and between education and other public services. Local resistance against the cuts was bolstered. The liberal tradition of lobbying in Sacramento was overcome (for at least one day). Hundreds of new activists and dozens of new organizing spaces emerged. And via their empowering experiences in struggle, many thousands of people began their process of politicization. Unfortunately, most of these positive aspects of March 4 are not even mentioned in “Crisis and Consciousness”. Would this widespread mass mobilization have been possible if the March 4 call had been only for a strike? Very unlikely. Had the call just been for a strike, the mobilization would probably have been limited mostly to the areas of influence of the radicals (i.e., a small percentage of schools). This can be seen by the actual developments of March 4. Every school and organization had the choice of what action to promote. As AS notes, there was much debate at most schools about what form of action to take; radicals had a good opening to push for strikes and in many cases did so (UCSC, UCB, etc.). If the objective situation was as advanced as AS implies, then it follows that at the very least (a) the call from radicals to strike would have met with a receptive echo at many schools throughout the state, and (b) there would have been some significant organic push from below by non-radical workers and students for a strike. But the fact is that at over 98% of schools and workplaces there was literally no motion from anybody beyond small groups of radicals for a strike. Indeed, the call for a strike met with little echo beyond UC Santa Cruz (UCSC) and among the Oakland teachers. Only UCSC was actually shut down — and the strike committee’s excellent organizing was greatly facilitated by the special geography of the school (i.e., the unique ability to paralyze the school by blocking the two main entrances at the base of campus). SO is right that people learn and advance their consciousness through struggle, not just through Leftist propaganda and ideological struggle between radicals and liberals. I imagine AS would agree with this; it seems like SO is misunderstanding where AS is coming from based on this one piece, without looking at AS’s overall practice which is far from confined to polemics against other Leftists. If this were really where AS is coming from why would SO call them some of the most talented and dedicated militants in the Bay Area? How would they have been able to play such a major role in the Oakland March 4th committee and elsewhere if they were focused only on polemicizing against other Leftists? It’s hard for me to put my finger on this point, but I am sensing there is a crucial issue somewhere in this debate over the relationship between revolutionary organization and mass organization. Correct me if I’m misunderstanding this, but SO seems to assume a large distance between these two. They say that the role of revolutionaries should be to put forward correct strategic/ tactical perspectives inside mass organizations to prove to the class that socialists are the most dedicated fighters, and from that the vanguard layers of the class will join the revolutionary party. For one, this seems to focus too much on finding the correct leadership, on replacing good leadership with bad leadership, as if the class would be stronger if only more socialists said the right thing in coalition meetings. What about building off of and reinforcing the militant consciousness that non-socialists bring to the table in these meetings? I agree that revolutionary organizations and mass organizations are not the same thing and we shouldn’t try to turn every coalition, strike committee, union, etc into a revolutionary group . I also agree that we need specifically revolutionary organizations that can put forward particularly revolutionary ideas if we want to avoid mass work being swallowed back up into economism or reformism. BUT, what about raising perspectives in mass organizations that draw out the revolutionary possibilities latent in the current mass struggle? From what I understand, adventurists in California have been doing this and they are attracting broad layers of people who were liberals in the fall and are now ultra-left Marxist or anarchists. Doesn’t this say something about people’s radical disillusionment with capitalism and the need to agitate against capitalism within the radicalizing milieu of the anti-budget cuts movement? (I’m talking now about activities and conversations among the milieu of the activists and the circles surrounding them, not necessarily every mass meeting or coalition program or flyer). What about recognizing, recording, intervening in, and advancing the current self-activity of the working class (including working class students), showing how it points toward things like the overthrow of management, workers’ control of the workplace, etc.? How can revolutionaries support and mentor organic militant-intellectuals from various workplaces and schools who get involved in the struggle with us? What forms of pedagogy and organization support this? These are the kinds of questions I see AS asking. It goes much further than simply proposing the right set of demands or the right strategy in a mass organization or coalition meeting. I have seen many Trotskyists systematically putting forward the right line in meetings but they still end up shutting out a lot of the new people who come around and they don’t follow up with them outside the meetings to support them and build their leadership. I guess this comes back to an old debate about Lenin’s What is To Be Done? If Lenin is right and the working class can only achieve trade union consciousness in mass organizations then the only vehicle for developing revolutionary consciousness is the vanguard party. If that were true then revolutions should focus on a) shaping mass organizations and b) recruiting members to revolutionary groups. If Lenin is right then revolutionary cadre should focus on building new revolutionary leaders among people who have ALREADY joined the party. But I disagree with this formulation from What is To Be Done (and Lenin himself retracted it later in his life). The working class does develop organic militants and organic intellectuals who go beyond the limits of trade union consciousness so revolutionaries need to build intermediate organizations, what Hal Draper called “centers”, which can engage with these militants and grow with them in struggle. That includes learning from them (here is where I have a growing appreciation for AS’s critical revamping of Pedagogy of the Oppressed). In Seattle, Unity and Struggle members are building the local of our revolutionary organization but we are not trying to recruit every worker and student militant immediately into Unity and Struggle. There is a broader milieu of revolutionary workers and students around us who have come to revolutionary consciousness through the struggle and through their life experiences. Yes we would love if as many of them as possible join Unity and Struggle but we are not assuming that they need to do that in order to be revolutionaries. We are trying to “meet them where they’re at” by supporting their revolutionary self-activity in groups like DI, IWSJ, and FADU so we can move forward together from there. I agree with how Labor’s Militant Voice put it in their response to the AS and SO pieces: ” Our role is to integrate with this movement from below, seek out the most combative and thinking layers, conduct a dialogue with these forces from which we will learn and they will learn and help organize these most thoughtful and combative layers into a cohesive fighting force.” Yes – we need to gather our forces. However, LMV incorrectly counterposes this to AS’s concept of pedagogy. As far as I can tell this is exactly what AS means by pedagogy, though AS members can clarify this better than I can. Any discussion of the debate around March 4th and particularly ATS’ piece should also include the response of ISO members from UC Santa Cruz who organized what was considered the most advanced action of March 4th. Here’s the response of James Illingworth, one of my Comrades at UCSC, to the article by ATS.